Head of Facebook campaign urging Israelis to move to Berlin fires back at Finance Minister who criticized the campaign. The owner of a new Facebook page urging Israelis to move to Berlin fired back at Finance Minister Yair Lapid on Tuesday evening, after Lapid gave a series of interviews to Israeli media outlets in which he criticized the campaign. “Today, Yair Lapid referred to the supporters of the Berlin protest as anti-Zionists,” the owner of the page, which encourages Israelis to move to Germany due to the lower cost of living there, wrote. In one of his interviews on Tuesday, Lapid said that the issue is not just a matter of prices, but a matter of national loyalties. 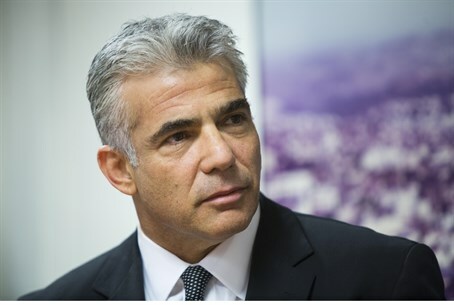 "This is a discussion on the identity, history, and purpose of our country," Lapid stated, in an interview on Army Radio. Lapid noted that protests like these - rooted in the 2011 "social justice" campaign - prompted his own shift from journalism to politics, and that he remains focused on lowering the cost of living in Israel. The Finance Minister has been particularly vocal about the trend of Israelis moving away from the country, decrying "all the people who are fed up and leaving for Europe" in a post on the subject last year. "I have little patience for people who are willing to throw into the garbage the only country the Jews have, because it's more comfortable in Berlin," he protested. Professor Manuel Trajtenberg, who headed the government-appointed committee that figured out ways to lower the cost of living for middle class Israelis following the 2011 social protests, has warned that the Berlin protest is “a real threat”. "All of a sudden Berlin has become more attractive and that’s a real threat. There is a sense of disappointment [among Israelis], and it does not matter whether there were successes or failures - you cannot argue with feelings", Trajtenberg said Monday evening.